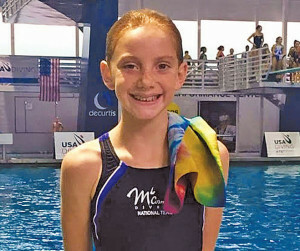 Ten-year-old Kate Butler, representing Long Beach-based McCormick Divers, took third place on the one-meter board and fourth place on the three-meter board at the USA Diving National Junior Championships last month in Orlando, Fla.
Butler, a former Junior National balance beam champion, had been diving for a little more than a year when she entered her first Junior National diving championship. Competing in the 11 and under age group, she challenged 40 girls in the preliminary competition, 30 in the semi-finals and 12 in the finals to place on the podium in both the one- and three-meter events. Butler became the youngest girl ever to complete a reverse 2 1/2 somersaults from the three-meter board in her age level. Another Long Beach diver has been making a big splash lately. Long Beach local Raquel (named for actress Raquel Welch) “Rocky” Dakota-Bartlow has joined the cast of Bravo TV’s “Below Deck” this season. The reality show “Below Deck” journals the lives of the crew members who work and live aboard a mega-yacht during charter season. I enjoy watching the show featuring “yachties” because it seems to me to be a cross between a modern, hip episode of “The Love Boat” and a civilized version of “Survivor.” Critics’ reviews during the first two seasons faulted the show as mundane. So for the third season, the producers added some spice by adding our very own Long Beach mermaid to the troupe. And she doesn’t disappoint. The Naples local and 2006 Wilson High grad has impressive credentials. She earned four letters each in diving and surfing, competed at the 2005 U.S. National Junior Diving Championship and the 2006 Summer West Nationals. In addition, she garnered all-league in 2005, twice won the all-star and all-state championship in surfing, and was the 2006 masters surfing champion. She even scored a diving scholarship to the University of Hawaii, where she became the conference platform champ in 2009. For five years, Dakota-Bartlow worked as a swim and surfing coach at the Long Beach Yacht Club, where she created summer lesson plans, led swim practice, planned events and helped with the mentoring program. Rumor has it that her cliff diving talent was realized when she did a swan dive from the Davies Bridge. Dakota-Bartlow also is a trained chef. Last year, she appeared on the Spike reality competition “Frankenfood” and cooked up her creation called “Rocky’s Surf & Turf” — a cookie made with calamari, squid ink chocolate sauce and vanilla ice cream, all topped off with a calamari garnish. Her meal didn’t win the $10,000 top prize, but it put her on the radar of casting folks in the world of reality TV. In season three of “Below Deck,” Dakota-Bartlow, the third stew and sous chef, brings spirit to the job. In the season premiere, she climbs to the ship’s top deck close to the radar. The height doesn’t faze this experienced diver, but it does get her in hot water with the captain. SPOILER ALERT — In a future episode, she will abandon all inhibitions when the sea calls; in another, she’ll win $600 cash in a passenger-led diving contest where her hidden talents are discovered. Dakota-Barlow gets her love of the water from her mom, who she often quotes during the show. Rocky’s mother is Jericho Poppler-Bartlow, International Surfing Hall of Fame surfer who won several big titles during her career, including the U.S. Championship, the International Championship and the first-ever women’s pro tour title in 1976. 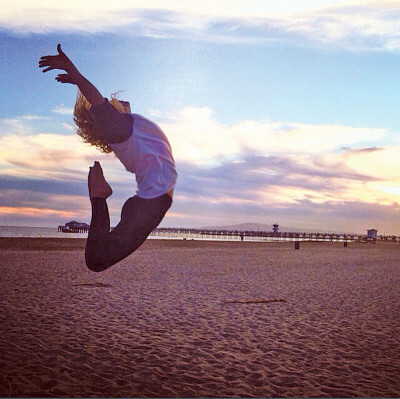 For record-breaking somersaults and Nielsen ratings, you can count on our Long Beach divers.